LATHRUP VILLAGE – Dr. Kathryn Wright died at home April 26. An adolescent pediatrician, Wright was committed to the treatment of HIV/AIDS in teenagers in Detroit, and was the founder of The Horizons Project, a highly acclaimed program of the Adolescent Medicine division of Children’s Hospital of Michigan. Founded in 1994, the program is the only HIV/AIDS medical program in Michigan that specifically focuses on providing services to HIV positive and at-risk youth ages 13 to 24. Wright left Children’s Hospital and The Horizon’s Project four years ago due to a disability. 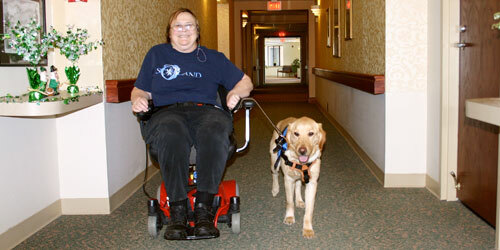 She and her service dog, Pumpkin, were featured in BTL last February. Wright, 61, was born and raised in the Los Angeles, CA area. She attended medical School at Michigan State University School of Osteopathic Medicine, graduating in 1980. She did her pediatric residency at Children’s Hospital of Michigan, and completed an adolescent pediatric fellowship in 1990 at the University of Washington Hospital in Seattle. A board-certified pediatrician, Wright returned to Detroit in 1991 where she practiced medicine until 2006 with the University Pediatricians, a private practice affiliated with Children’s Hospital of Michigan. Wright was a board member of Affirmations in the early 1990s, and was an expert consultant to the Affirmations Youth Program. Wright is survived by her daughter, Jordan, 19, now living in Toronto, her mother Shirley Byrd and stepfather David Byrd, and six siblings; Diana Troxell, Virginia, David, Maria and John. She is also survived by her life partner, Sue Brooks, and her former partner and Jordan’s co-parent, Joette Lambert, and by her aunt, Barbara Wright. A memorial service will be at 7 p.m., May 6 at Northwestern Unitarian Universalist Church, 23925 Northwestern Hwy, Southfield, 48075. In lieu of flowers, donations may be sent to The Horizons Project, 3127 E. Canfield, Detroit, 48127.